Wouldn’t it be great if star employees never left? But we all know that at some point something will happen that’ll cause one of your “A” players to leave. What that “something” is may not be in your control. Problem is, employee turnover costs companies A LOT of money! Direct employee replacement costs can reach as high as 50% to 60% of an employee’s annual salary, according to the Society for Human Resource Management. And when other factors are included, total costs can soar as high as 90% to 200% of an annual salary. Pay attention to your employees and watch for signs that they may be getting restless, and nip it in the bud. dressing extremely nice to work when they usually don’t. A good indicator that an employee is looking to move on is a recently updated LinkedIn profile. Check to see if he’s sharing regular status updates. If so, that’s a pretty clear indication the person wants to be noticed. Also, you can search niche job boards to see if your star player has posted his resume. If all of a sudden certain employees start asking to attend conferences, they could be trying to make themselves more visible. They could also be trying to attain more industry knowledge. So it’s up to you to figure out what their motives are. When employees start leaving their work area to take personal calls on a regular basis, they’re likely entertaining new job offers or having a personal crisis. Don’t jump to conclusions, but start digging to see what’s going on or check out some of these other indicators. Major life changes often spur people on to make more money, get a better title or give up working altogether. Some of these events are getting married, getting divorced, having a baby, buying a house or having a spouse get a new job. Can the employee do her job remotely? If so, make the offer so you don’t have to replace her. Suspect someone is looking for another job? Pull out his resume and check past job tenure. Does the employee have a history of moving on after five or six years at a job? If so, it’s very likely history will repeat itself, unless something is done to change his mind. Do you know why your employees left their previous jobs? If not, find out. Employees are often consistent with their reasons for leaving jobs. So make sure during interviews you ask potential employees what factors made them leave their previous jobs. If you hire them, make note of it and refer back to it on a regular basis to see if those factors are occurring with their current jobs. Do you have an employee who rarely complained, but is now complaining a lot more? That’s a big red flag. Something has gotten under that person’s skin and she isn’t happy. Find out what’s wrong. If you don’t, you may be replacing more than one person, if her attitude starts rubbing off on her co-workers. If someone on your staff leaves, and he has a close friend in the office, guess what? You may be replacing two people. Often, it’ll happen because the employee who left will actively recruit his friend to join him at his new company. If the person isn’t recruited by her friend as in No. 8, then the employee may start to isolate herself. If your employee is checking out, she may not feel the need to continue cultivating personal relationships at work. If this happens, it’s a good idea to approach her and talk about it. Have you noticed that one of your best employees is butting heads a lot with another employee? If so, it may behoove you to find out what’s going on and help resolve the matter. If the relationship if left to fester and become toxic, it may cost you a valuable employee. Is one of your team players suddenly delegating his work to others? He may know something you don’t, like he’s interviewing for a new job. Unless you’ve authorized the reassignments, call him on it. It’s your right to find out why he is lessening his workload. Maybe it’s a medical issue or maybe he’s got one foot out the door already. When someone is moving on like in No. 11, she starts reducing her production levels. 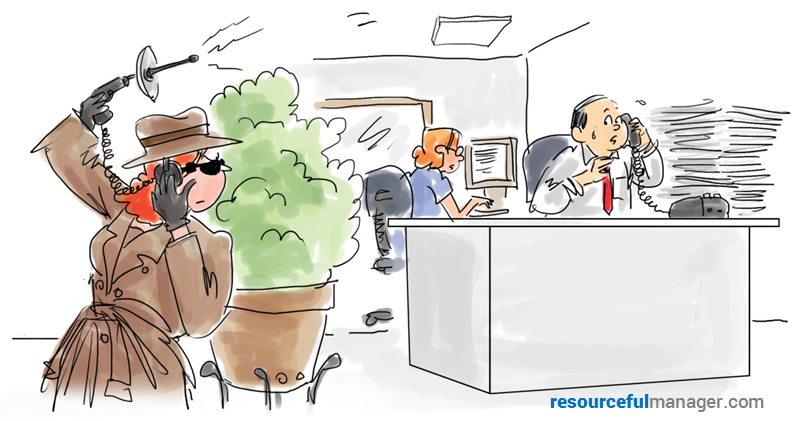 So when you notice that a good employee is no longer participating in meetings or offering to help with extra assignments, it’s time to investigate. It may seem like a lot to keep your eye on all of this, but it’s a lot less work than finding new star employees! To get help, connect with the person who’s got his finger on the office’s pulse. Every office has one or two people who know just about everything that’s going on. Identify who that is and ask him to let you know if he thinks any key employee is unhappy and/or looking for a new job. Even though you probably never thought that one of your jobs as a manager was to identify star employees getting ready to jump ship, it’s in your best interest to periodically review your staff for people who may be looking to move on. Sit down with them and talk, see what’s going on in their heads. If you can change a few minds, it’ll save your company a lot of money and you a lot of time! What signs do you look for that tell you someone is looking to make a change? Share your thoughts in the comments box below. There’s nothing worse than when your good people jump ship. So how do you keep them? 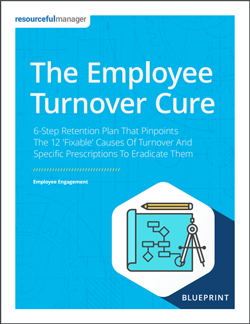 Check out The Employee Turnover Cure Blueprint. Click here to get the Blueprint details. Keep them coming! Inspires me to be a more effective co-worker, leaders and an influence in the workplace. Really gives me satisfaction on the job. I’m glad Resourceful Manager is inspiring you to be a better leader! It’s music to our ears! Hi Renee : Your posts are insightful and educative. As an HR Professional [I believe I am one ! ], in my considered opinion, your expositions are value propositions. Thanks, all the best, and am looking forward to getting further enlightened when I get to receive more such posts. Thank you Vikas! I hope you continue to be enlightened by Resourceful Manager! A handful of things you don’t want to do as a manager, leader, or anyone with managerial capacity; is take your one of your star employees for granted, pass them by when the raise truck rolls up, box them in to the one very thing they pull all the weight of a company with, detach personally, zero chances of promotions anywhere, insincere thank you’s for work done in record time & isolate yourself with your mangers club….& finally, during one of these talks suggested, don’t say you think they’re going to be in the same position boxed in for a long long time & laugh. You’ve sealed your fate with the devils you don’t know. As one an employee that pulls major weight in technical manufacturing, these are the issues that have me hunting for another job & waving my middle finger in the air as I leave & wishing you good luck finding someone with more technical skills and abilities shown and many more up my sleeves you will not tap into because you’ve boxed in.